Live from Squid Research Lab is the official North American Splatoon Tumblr account run by Nintendo of America. It is a constant source of information and is usually used for new weapon and map announcements as well as Splatfest information and results. The post revealing the Splattershot Jr. Prior to the release of the game, the account was used to announce basic information, including several weapons and information on Octo Valley. Pictures of outfits, modes, weapons, and more were posted leading up to the game's official release on May 29th. The picture posted by the account based on the winning drawing. “ Splatoon ART CONTEST report! So…turns out our senior squid artist quit like two months ago and didn’t tell anyone. And now we need a bunch of sketches ASAP for our quarterly report, but when I checked his old desk drawers, all I found was a snorkel and a bunch of those little red sticks that come with the cheese-and-cracker packs that you use to spread the cheese. Remember those things? Anyway, I was in a full-blown panic until I thought of you guys! I bet some of you can draw some cool Splatoon art. Squid Research Lab needs your help! Here’s what I’m thinking: Post your awesomest, most squidtastic Splatoon-themed artwork on Tumblr and tag it with #Splatoon, #GetInked and #NintendoContestEntry so we can find it. We’ll even give out some cool prizes for the ones we like best! The report is due on May 29, so you’ve got until then to show us what you’ve got. Y’all are the best! Oh, and the contest starts...RIGHT NOW! The contest ran until May 29th. A few weeks later, the account posted the five runners-up and one winner with notes from the Splatoon Dev Team explaining why they liked the picture. frogbians came in sixth, stupjam came in fifth, bluegenesis123 came in fourth, nelnel-chan came in third, and cowsgomoose came in second. The winner was funkgamut, who drew a picture of the subway that can be seen in the background of Inkopolis Plaza. The account later posted a picture based off of funkgamut's as thanks for participating. The post revealing that the N-ZAP '85 would be released soon. Starting on June 2nd, four days after the game was released, the account began posting information on upcoming stages and weapons (the first being Port Mackerel and the N-ZAP '85). Since then, the account has become most notable for its weapon reveals. They are usually revealed the day of their release early in the morning. The Ranked Splatometer in the second post. The Tumblr account was also the source of the Ranked Splatometer, which showed how many players had to reach Level 10 before Ranked Battles would be added. The account made five posts related to the Splatometer. The first announced that Ranked Battles would be made available when a certain amount of players reached Level 10. 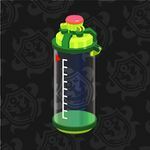 The second post showed an empty Splatometer and stated that updates would be given. The third and fourth posts showed updates on how full the Splatometer was, and the fifth and final post announced that the Splatometer had been completely filled and Ranked Battles would be released that evening (June 1st) at 7pm PT. “ SAFETY NOTICE: Urchin Underpass will be undergoing important construction work. Entry will be strictly forbidden from August 2-5. We’re looking into what could have caused this construction notice, but word on the street is lots of new content is about to hit Inkopolis, including two new weapon types, all sorts of new gear, level cap increases and even new matchmaking options! The post was posted on July 27th. It corresponded with the reveal of a massive August update being released on August 6th, which was a day after the construction work to Urchin Underpass was stated to end. The update included Sloshers and Splatlings as two new weapon types, new gear, level caps increased (Level 50, S+ in Ranked Battles) and two new matchmaking modes (Squad Battles and Private Battles), and, most relevantly, an update changing the layout of Urchin Underpass. Following the announcement of Splatoon 2 at the Nintendo Switch presentation on January 12th, the Tumblr account started posting information on the upcoming game, including information on Inkopolis Square, Turf Wars, stages, and the new mini-map. As the release drew nearer, Live from Squid Research Lab also began to post information on characters and weapons, though, unlike the posts leading up to the release of Splatoon, much of this information was outdated and had already been revealed in other mediums such as Nintendo Directs or at Nintendo's E3 presentation. Still, the occasional tidbit of new information can be found by browsing the site. This page was last edited on 19 September 2018, at 15:10. This page has been accessed 36,686 times.